The annual Spring Banquet will be April 26, 6 pm to 8:45 pm at the Crowne Plaza Hotel on Fort Couch Road in Bethel park. Student Tickets are covered by 2 hours of Bunny Breakfast work. Student admission for those who did not work at the Bunny Breakfast is also $25. If you would like to attend please fill out the Banquet form and return it to Mrs. Kipp with payment. Our annual dinner dance at the Crowne Plaza hotel is scheduled for April 26th. Social time starts at 6 pm with dinner served at 6:15. The evening concludes at 8:45 pm sharp! Menu is garden salad, chicken fingers, penne pasta marinara, ranchero potatoes, buttered corn, bread and butter, soft drinks and cake. Cost for the evening is $25 a person. Parents are invited and encouraged to attend! Cost of the evening was subsidized by working 2 hours at the Bunny Breakfast. _____________________ (student name) plans to attend the chorus dinner dance. TOTAL for student and family is $25.00 per person. Along with 15 seniors graduating this year we have 3 of the 4 officers also leaving the chorus parents group with them! We need new officers! Please drop Mrs. Kipp an e-mail @ LKipp@cvcpa.org and plan to attend our last meeting of the year on May 9th in the chorus room at 7 pm. Many hands make less work!! We need a breakfast coordinator, a treasurer and a fundraising officer. We had a great turn-out of chorus students and parents for the annual breakfast. The HS cafeteria was a wonderful venue and the parents and students that decorated it Friday night did a lovely job. The 25 + students that worked the event will have their banquet on April 26th at the Crowne Plaza Hotel (across from S Hills Village) paid for by this event. Please remember our dress rehearsal on April 8th from 6-8 pm for the Spring chorus and senior recognition concert. The Concert is April 11th at 7 pm with sign in for students at 6:20. This has been a great year for CVHS chorus. Thanks to all of you that helped make our events happen! Please click the link and follow the page! Psst –> It’s Bunny Breakfast week! Student shifts cover their ticket to the spring banquet. Adults: if can work or donate in support of this fundraiser for the students, please contact Mrs. Kipp at lkipp@cvsd.net. Main set up is Friday evening. Volunteers for early shift please arrive at 8:30 Saturday for last minute set up and food prep. Most of all, tell everyone about the Breakfast and ENJOY! The NYC trip was so much fun! The students sang beautifully, saw lots of worthwhile sites and enjoyed many activities. Please help!! Many hands make light work and this a really fun activity for a great cause.. We need you to keep the student workers organized, flip pancakes, color eggs, serve meals and help clean up. The shifts are from 8:30-10:30 and 10:30-12:30. However an hour would be great! Concert Dress rehearsal on April 8th from 6-8 pm. Spring concert and senior recognition on April 11th at 7 pm. 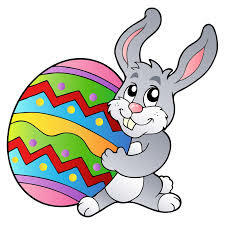 Bunny Breakfast is March 30, 2019 in the HS cafeteria 9am to noon. Hi parents of chorus students attending the NYC trip March 14-16! Wah-hoo! March 13th-drop of of suitcase for your student. We’ll have tags to place on it and one for their back-pack they’ll bring the next day. March 14th- be at the school at 5:30 for a 6AM departure from the chorus room. Students will call on their way home on Saturday. Time approximately 11pm. Be on time to pick up your student. Invest in a portable phone charger. The bus will drop us off each morning and pick us up in the evening. Students must stay in touch at all times. Completed , notarized forms need to be turned in by March 8th. Chorus T-shirts are $15 payable to CVCPA. These also need to be paid for by March 8th. Students report to the chorus room on March 14th dressed in black chorus T-shirts, black pants and sneakers. Have a backpack to carry around NYC. Layer clothes. If you’ve misplaced your forms please see the recent email or contact chartiersvalleychoruspsa@gmail.com. Students should bring a copy of the itinerary. Hadley Kappers will be available at the Thursday meeting to notarize your forms for $5. Please remember that T-shirt payments are $15 and due by March 4th. These are worn by ALL chorus students at the upcoming concert. Students may use money in their accounts or raise the money by selling a box of chocolate- $30 check written to CVCPA. 6:40 for chaperones and everyone at 7 pm. (Chorus room). Enter the P arts wing at the door across from the MS entrance. Please bring completed forms if possible. The UPS at 1597 Washington Pike, right by the high school, has notary service for $10. Please bring a double-sided copy of your student’s medical insurance card. You may see ads at the bottom of many posts in the blog. We do not not get any revenue from them (or even know what they are.) All of the ads are generated and controlled by WordPress. Allowing the ads makes the website / blog available to us to use for free.